Motor Connection with VFD, Delta or Wye? This is good for the flux waveform but it is not seen by the VFD internal current sensors so you can over-flux and get high motor winding currents giving motor overheating with no indication in the VFD. So with Delta I recommend winding current sensors but this is extra complications. With Wye all harmonics are seen by the inverter which stops over-heating but the inverter can not supply the third harmonics on a normal 3 wire design. I prefer to have a Wye connection in the case of getting a grounded neutral to have a clear path to ground for the high frequency noise of the inverter system regardless of the motor, but that may not be of concern to you if the other connections around the system are not noise sensitive then using a delta connection can save you on the cost of copper wire if you are running over a long distance from the VFD. Then you can ground the Shell of the Motor. We have to consider the motor design as well. Is the motor an inverter duty motor or a direct online motor? 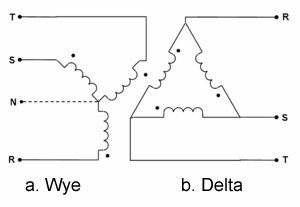 What voltages are the windings set for and does it have a wiring diagram for delta or a wye? Let me describe one special case of motor connection. It's a variant, how to get more mechanical power from the motor comparing to direct on-line operation. Rated VFD output current not less than motor current in Delta connection. Motor rated voltage 400 V, Motor rated frequency 87 Hz. V/f line comes through rated motor point 230V 50 Hz to maximum point 400 V 87 Hz with correct ratio. Motor develop constant (rated) torque from low frequency to the maximum one on 87 Hz. According to formula Power = Torque * Rotational speed, on 87 Hz motor can provide mechanical power 1,7 times higher, comparing to the direct connection to the mains. 2. Rated VFD output current not less than motor current in Delta connection. 1. V/f line comes through rated motor point 230 V 50 Hz to maximum point 400 V 87 Hz with correct ratio. to the direct connection to the mains. I have some confusion here, since the motor is at delta connection and it's expecting 230 V, will it be any damage since we are supplying 400 V on it? The 400 V is the input of the inverter not the motor. you parameter the drive with 230 v in rated motor volt parameter so it will not out more than that.